This post contains paid and/or affiliate links. See full disclosure. Laundry. It’s something we all dread (at least I do), but it’s a necessary part of life. Anything I can do to make laundry easier, faster and more eco-friendly are huge bonuses in my book. That’s why I love wool dryer balls. I’ve been using them for over a year now, but I have a few that needed replacing. They are pilling pretty bad and starting to get deformed, so I wanted to get more to optimize my use of them. If you’ve never used wool dryer balls, did you know that adding 6 of them to your clothes dryer can cut drying time by 25% and soften your clothes naturally (as well as reducing wrinkles and static)? So you can save on your laundry-related energy costs while eliminating your family’s exposure to the horrible chemicals that are in dryer sheets. So was was really excited to receive 6 new dryer balls from Woolzies to add to my dryer. 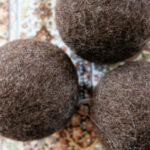 These dryer balls are handmade from pure New Zealand wool in Nepal, and they provide a reliable source of income for the needy women of that developing country who make the dryer balls. So far, I am impressed with the quality of the Woolzies dryer balls, and was pleased to read that they are guaranteed for 1,000 loads. I have put them through probably about a dozen loads so far, and I haven’t noticed any pilling like I’ve experienced with some other brands. I think they’ll last us well over the 1,000 load guarantee. If you want to green your laundry routine, check out Woolzies dryer balls. You can pick 6 of them up for $34.95. I’ve been wanting to try some. I’ve heard some say they work and others, not so much. I like that they last for 1000 loads. I learned they are hypo-allergenic and safe for those will wool sensitivities. You can add essential oils to wool dryer balls too. I do it all the time! They reduce drying time by 25%! These will not reduce the fire retardant properties in clothing. I love dryer balls. Saves on my electric bill and softens towels! I really like that these dryer balls aren’t supposed to shed, and they last for 1000 washes! Incredible! people are allergic to wool? never knew that. lasts for 1000 loads? how do you remember when it is the 1000th load?! They are PVC free and won’t fall apart or melt on you. They last for 1000 loads and are OK for people who can’t normally wear wool! I like that Woolzies are made with New Zealand wool and that it reduces drying time 25% a load.. I like that they last a long time.. I love how they eliminate the need for any yucky fabric softeners. love the idea that they are very long lasting and take the place of fabric softener! It’s hard to believe they are homemade. Interesting how they work. Safe for cloth diapers, last for 1000 loads, and reduces drying time! I learned they are handmade by women in Nepal and provide a steady source of income for these women. Good for the earth and good for people! I learned that they are safe for people who have wool sensitivities! I learned that it cuts down on drying time. They last for a thousand loads! That’s great! I learned Woolzies are tested to last for 1000 loads. They cut down on drying time by 25%. Wow! I’m a little bit tempted to buy these on my own. I never knew about the fire retardant. I never really thought about it. These look like so much fun. I’ve been eating to try them just have not ordered them yet. Would be great to win. I learned that not only do these cut your drying time, it also eliminates the need for fabric softener. I learned that they last for 1,000 loads which is LOADS better than my dryer sheets! I learned they are hypo-allergenic which is a necessity in this house! Woolzies dryer balls are 100 % New Zealand wool and are completely handmade, which accounts for the variations in size, color and texture. I’ve been wanting to try these! I learned they last up to 1000 loads! I learner that they are hypoallergenic and won’t shed onto laundry. Woolizes lasts for 1000 loads! Wow! I love that they are sustainable and reduce drying time by 25%! They last over 1000 loads! Cool! Woolzies last for 1,000 loads and they reduce drying time. I learnt that these dryer balls also reduce static and wrinkles. I love how these reduce drying time! They do free shipping and gift wrapping. I have one set of these and they are going to be on my Christmas list for this year for family and friends. They cut down on drying by at least 25%, which to mean screams lower electric bill. I also absolutely love that they last 1,000 loads or money back. Seems like a good company sure of their products ability. I learned Woolzies last for 1,000 loads! Also that they are a fabric softener, wrinkle reducer, and cut drying time by 25%. I would LOVE to win this one! Thanks! They save time, energy, and money. They remove wrinkles and static. I found out that they are made in Nepal. Using Woolzies will cut down your drying time by 25%, and it’s true!! I’ve used them and it really does help! They work as a natural fabric softener. They last for 1,000 loads of laundry and cut down on drying time. I learned that they are safe for people with wool allergies! Woolzies last for 1,000 loads, contain no PVC, and will not shed and bother those with wool allergies. Never knew these existed! So cool. I like everything they say about them..like reducing drying time..no piling..etc..but I dont wanna pay out that much money for something and then find out I was a sucker & they are junk. Since I live on a fixed income, these would be cheaper (in the long run). But if they dont work, then Im really hurting. SOO maybe Ill get lucky & my name will be picked to try them for FREE !!!!! Thanks for the chance at it anyway….. They deliver the same benefits for laundry as conventional fabric softeners WITHOUT all the nasty chemicals. I learned that they reduce drying time and are safe for people with wool allergies. They last a REALLY long time! They wont fall apart and or melt either! thats always a plus! cuts drying time down as well! I learned they ship world wide and last for 1000 loads. I didn’t really learn anything new, because I already have some of them. If I win, I’m giving them to my expecting sister-in-law! I learned they won’t shed on laundry, a major concern of mine b/c wool makes me itch. I learned that you can use these even if you have a wool allergy. Reduces static!! Also safe for people with wool allergies. I’m happy to learn that they reduce total drying time by 25%. I love that it actually helps to save money on the electric bill. THANKS! DISCLAIMERS As an Amazon Associate I earn from qualifying purchases.The content on Happy Mothering is provided for educational and informational purposes only, and is not intended as medical advice. Please consult with a qualified health care professional before acting on any information presented here. Statements on this website have not been evaluated by the Food and Drug Administration. No products mention are intended to diagnose, treat, cure or prevent disease.